"UND Sioux Ceramic Pendants Lot 26, Brown/Tan - Side B"
Tan/brown colored ceramic indian head pendants/medallions. Created beginning in the 1930's for the University of North Dakota, Sioux football (plate 64). 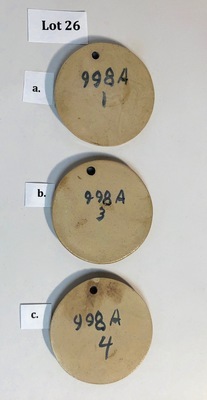 "UND Sioux Ceramic Pendants Lot 26, Brown/Tan - Side B" (2018). UND Pottery Collection. 2005.